Start getting better grades in Algebra with 24/7 homework help from an Algebra tutor. Our tutors are experts in Algebra I and ready to help you with your specific Algebra problem. Our Algebra tutors can also help you find Algebra worksheets and practice problems to help you prep for Algebra tests. You’ll get personalized, one-to-one help from our expert tutors. Tell us about your problem, and we’ll find the best tutor for you. 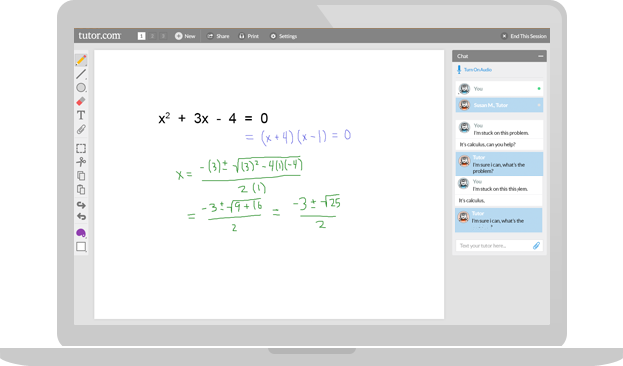 You and your Algebra tutor will work in our online classroom and use the interactive whiteboard to solve Algebra problems, check Algebra homework and review Algebra formulas. Students who use Tutor.com get better grades, feel more confident and complete their homework on time. Start getting better grades in your Algebra class—find an Algebra tutor now.